University City might have gotten its name from the three universities that call it home, but it’s the technology and innovation pulsing up and down Market Street that are reinventing this neighborhood on the west side of the Schuylkill River. FMC Tower at Cira Centre South, the newest addition to University City’s skyline, is ready to take the term “vertical neighborhood” to the next level both literally and figuratively. This 46-story skyscraper is the first to offer luxury hotel residences for long-term and short-term stays high above the skyline. AKA University City is one hotel you’ll never want to leave, and thanks to the available apartment residences, you never really have to. 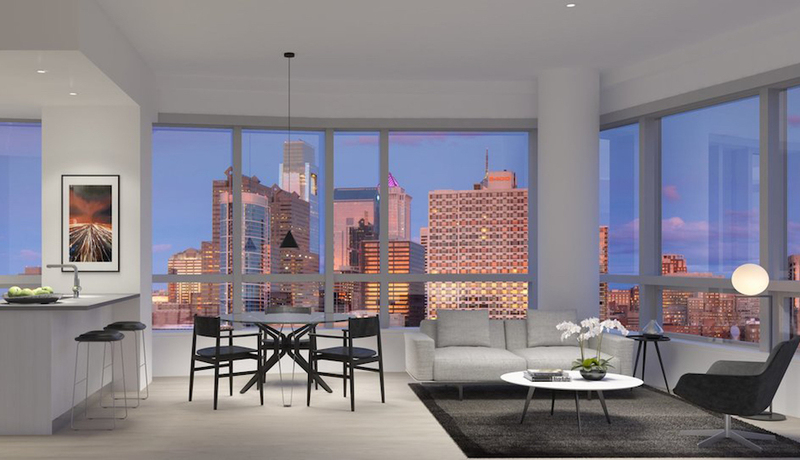 Whether you’re a Philly native trying to check out a new view, or you’re fresh off a train from neighboring 30th Street Station, seeing the whole city starts with a view from AKA University City’s hotel residences on floors 29 through 35. For day, week, or month-long visitors, these suites offer all the comforts of home—and more. Ultra luxury suites designed by Lissoni Associati provide guests with full-service amenities, including housekeeping, concierge, groceries, reservation assistance and laundry. … and be able to stay as long as you want. Don’t want to leave? Just move a few floors up and you’ll be in AKA University City’s apartment residences. Whether you’re inspired to designing your own space or are looking for a fully furnished spot, these chic studio, one- or two-bedroom and penthouse apartments are available for annual or semi-annual leases. Fully furnished residences are uniquely designed and decorated so each space has its own personality. You can get some air (regardless of the weather). Cabin fever? Jet lag? Take a trip to level 28 for a fitness escape that goes way beyond a rack of weights and elliptical machine. The club level features a state-of-the-art Technogym fitness equipment, a 72-foot indoor swimming pool a 3D indoor golf simulator (to stay up on your game while you’re away from the green), a private theater complete with leather reclining seats, a private dining area and landscaped terrace with 360 views of the city and fire pits to gather around with friends. You might be 400 feet above street level, but all that you need is just an elevator ride away. For those of us who might be feeling envious of level 28, memberships will become available to the public as well. Still feeling the need for fresh air? No neighborhood is complete without a park, and Philadelphia’s first vertical neighborhood is no exception. Steps from the AKA University City residences is Cira Green, a one-acre greenspace where you can take in the city skyline from a cozy patch of grass. … and dine on Michelin Star-worthy meals at night. Dine in top-chef style any day of the week. Head to the ground level of FMC Tower for fresh, seasonally inspired meals courtesy of Michelin-star restaurateurs Branden McRill, Patrick Cappiello and chef Daniel Eddy. Ready to book your new home away from home? For more information visit akauniversitycity.com.